Unlike many of the other properties in the area, the Goldtown Hideaway is located only 2 blocks from Nevada City’s downtown district. A beautiful 5-minute stroll takes you to all of this wonderful town’s amenities and attractions. Nevada City, located in the heart of Gold Country, is known to be amongst the most interesting and charming of California’s Gold Rush towns. 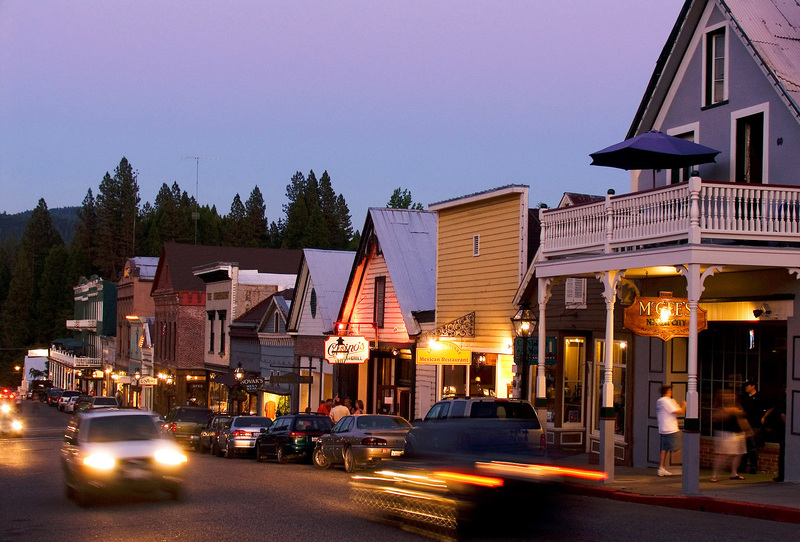 The entire town is a national historic landmark where guests enjoy great restaurants, unparalleled nightlife and entertainment, and a variety of fine shops, boutiques, galleries and museums, all flavored with old-fashioned Nevada City hospitality. This historical town is located only a few miles from the Empire Mine State Park and also the Nevada County Fairgrounds, host to the Nevada County Fair, annual Celtic and Bluegrass festivals and many other hugely popular festivals and events. Nevada City is a cultural center hosting everything from Victorian Christmas to the Wild and Scenic Film Festival, and a number of holiday parades and festivities weekly throughout the entire year, making it an ever popular destination for both local Northern California / Bay Area and international tourists. Anyone interested is urged to visit the Nevada City Chamber of Commerce’s website. Celebrate summer Nevada City style at the Farmer’s Market enjoying live music, local farmers, vendors, and artists, freshly baked treats and more. Shop for healthy food, locally grown with care and pride. Come, feel the energy and live the goodness! The historical Minor’s Foundry Cultural Center and several historical in-town theaters and production groups are only a two-block walk from the Goldtown Hideaway, making this the perfect place to stay for visiting Nevada City’s nightly concerts or theatrical productions. Additionally, Grass Valley is only a few miles away for a show at The Center for the Arts. Check out a link to Grass Valley’s Chamber of Commerce for a calendar of events and more. Broad Street’s many annual parades and events take place only a block away from the Goldtown Hideaway. The Gold town Hideaway is located just a few blocks from the entry point of the Tribute Trail, a fantastic hike along Deer Creek with its own newly completed suspension bridge, creating a loop over the Creek and back into town! Other hikes accessible from town are the Cascade Canal Trail, the Hirschman Trail and more. The mountain biking in this area is world class, in fact Nevada City hosts the annual Nevada City Bicycle Classic held on Fathers Day weekend, it’s one of the premiere sporting events in the Sierra foothills, the largest and oldest bike race on the West Coast, and the second-oldest race in the nation. Just 6 miles outside of town, you discover several entry points of the breathtaking Yuba River; Bridgeport, Hoyt’s Crossing, Edwards Crossing, Purdon, and many other entry points within the Tahoe National Forrest. Dining in this gold miner’s town in unparalleled. There is an incredibly diverse cross-section of restaurants, wineries and cafés, with just about everything to please one’s palate, many of which use locally sourced ingredients from Nevada County’s many organic farms and resources.